At this example of a polarimetric radar the transmitting energy is divided by a -3dB-coupler into two parts of the complete power. These two parts are sent by a dual polarization feed horn with a different polarization simultaneously. By a switch this radar can transmit in a single polarization plane for measurements of the reflectivity only (just with this one then with the double power, however). But in this case however the radar also receive in the two polarization levels. Both signals are evaluated in the signal processor. This is very expedient since the orientation of the electric field always changes itself at a reflection. The radar transmitter produces the short duration high-power rf pulses of energy. This power divider divides the transmitters power into two equal parts. One part of power will be radiated into space by the vertical polarized feedhorn, the other one by the horizontal polarized feedhorn. If single polarisation is switched, then the divided parts of energy are added again into this powerdivider. 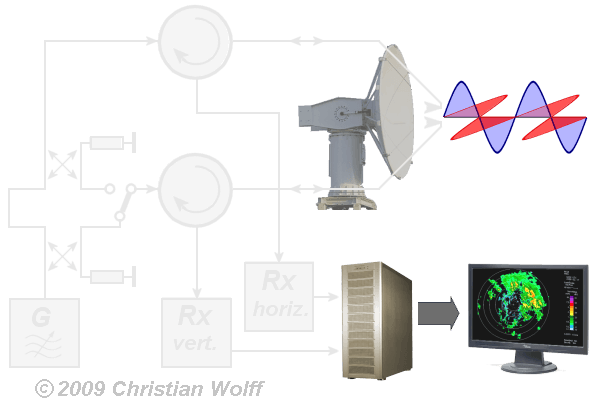 The part of transmitters power for vertically polarization would be conduct either to the feedhorn for vertically radiation (then the radar ist dual polarized), or back to the main horizontally feedhorn (then the radar ist single polarized). The detour line provide phase coincidence of the both parts of energy. The directivity of the feedhorns is added to that of the parabolic reflector. The resulting pattern is a very narrow and concentrated beam with dual polarisation. A dual feedhorn is used to feed the transmitters energy into the parabolic reflector with the necessary polarizations. The duplexer alternately switches the antenna between the transmitter and receiver so that only one antenna need be used. This switching is necessary because the high-power pulses of the transmitter would destroy the receiver if energy were allowed to enter the receiver. The receivers amlify and demodulate the receives RF-signals. The receiver provides videosignals on the output. 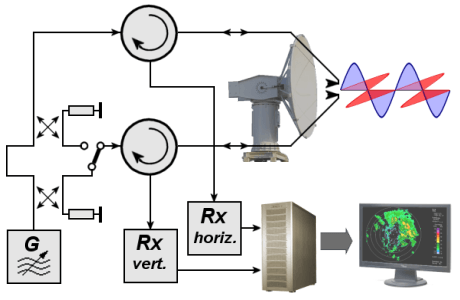 The signal processor is that part of the system which separates weather information from clutter on the basis of Doppler content and amplitude characteristics. The indicator should present to the observer a continuous, easily understandable, graphic picture of weather information.